Given below the details lists of technical drawings terms essential at construction site. 1. Tender drawings: These types of drawings are provided to the bidders at the tender time to estimate the blank BOQ. It should be studied in accordance with specifications to exact pricing of the BOQ. As for instance, sometimes supports are not cited in tender drawings but if it is given in specification, bidder should take the cost of that supports into consideration at the time of estimating the specific item. Tender drawings & specifications play an important role in the post contract phase to manage variations. 2. IFC Drawings: It is the abbreviation of “Issued for construction”. This type of drawing is submitted by the consultant for construction purposes and formation of shop drawings to the contractor. Sometimes, the drawings are circulated for reference and information purposes. They are called as “Issued for reference” (IFR) and “Issued for Information” (IFI) respectively. 3. 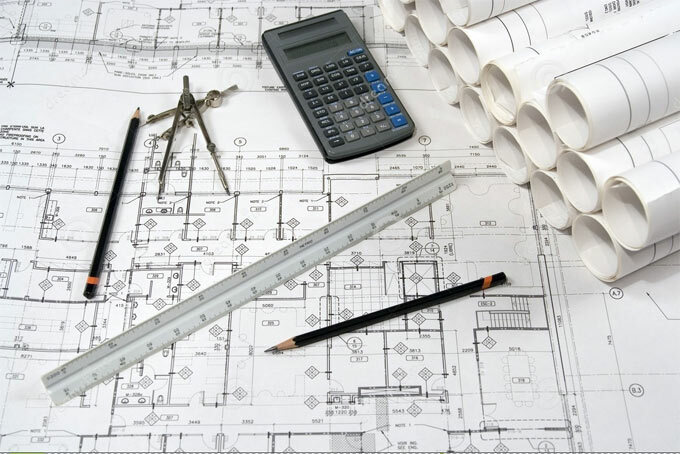 Architectural Drawings & Structural Drawings: These two drawings are responsible to determine the strength of the construction. Generally, the architects create the architectural drawings and the structural engineers create the structural drawings. Mainly, the architects put the client’s requirement into paper. Structural engineers take the responsibility to check that the architect’s design is structurally secure. Both the drawings are dependent on each other. 4. Interior Design Drawings (ID drawings): It offers the details or the interior structure of the construction project. For the commercial building projects it is very important. To provide standard interior to the project, exact coordination with other trades is essential. 5. Shop drawings: It is arranged by the service provider as well as sometimes by Sub-contractor or supplier. The shop drawings provide proper guidance to the people who are executing the actual work at the construction site. It contains more details as compared to other construction drawings. When MEP Sub-contractor creates shop drawings, he has to submit the IFC, ID drawings, Architectural Drawings & Structural Drawings to make the coordination perfect. 6. Request for Information (RFI): It is extensively applied in construction industry. While generating the shop drawings, if the contractor detects any inconsistency, he should inform it to the consultant for modification. It is called as RFI. The response should be utilized for the continuous process. 7. As-built drawings: The contractor arranges these drawings as soon as the works at construction site are completed. These drawings indicate the actual construction of the project. These drawings are utilized for the final account purposes and the maintenance purposes.